New Forest organisations are cautiously optimistic after reporting that no animals have been hurt in the New Forest for a record-breaking five weeks. There are around 7,000 ponies, donkeys and cattle roaming free across the Forest and their grazing plays a vital part in shaping the iconic New Forest landscape and maintaining the rare habitats which support internationally rare species. Although the general trend is a reduction in animal accidents, last year 67 Commoners’ animals were either killed on the roads or had to be put down due to their injuries - two more than 2010. There was also an increase in the number of animals being injured, which went up from 27 in 2010, to 36 in 2011. Many of the accidents involved local drivers. Sue Westwood, Clerk to the Verderers and Chair of the Animal Accident Reduction Group, said: ‘We have never had such a long time without any accidents. We hope it’s a sign that people are driving more carefully across the Forest, and giving animals on the verge a wide berth. New Forest National Park Member Bob Morris said a wide range of organisations are working together to prevent animals from being killed and injured. Animal accident hotline cards tell drivers what to do if you witness or are involved in an accident involving a pony, donkey, cow, pig or sheep. 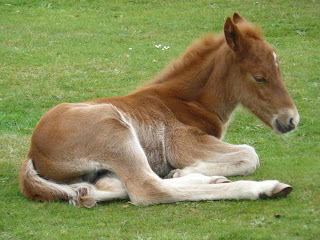 The cards are available from garages and Local Information Points across the New Forest.